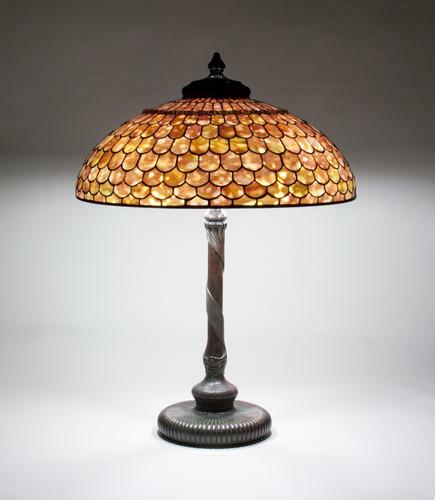 An original Tiffany Studios Table Lamp, comprising a 22-inch diameter leaded glass 'Jeweled Fish Scale' Shade, featuring richly saturated and heavily mottled Tiffany Glass in an all-over fish-scale pattern, incorporating a decorative row of rounded Tiffany Favrile Glass jewels in the upper register. The shade sits on a ribbed bronze table base in the Art Nouveau taste in a rich brown-green patina. Both the shade and the base are signed.